Pack your bags for DEAL’s latest deluxe travel offer to the exotic city of Hanoi. Hanoi has been the heart of Vietnam for centuries. The town has been through several official adjustments on alias. Hanoi offers an elegant city which is well mixed of decent Asian lifestyles and exotic French influences in people and arts so it is easy to find your own spot in Hanoi. The city collects finest bits from the outsiders and amazingly turns out matched to your expectations. 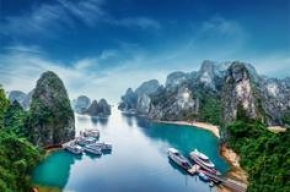 While there, take in the glorious sites in and around Hanoi as well as spend a night on board the luxury cruise on Ha Long bay. For a once in a lifetime experience, snap up this travel deal and head to Hanoi with your friends or family.